Donte Sheppard lived in 15 different houses and three shelters. He lived with different family members and in foster care. His mother was 15 when he was born. He didn’t meet his father until he was 30. He attended nine different schools. He failed out of college. But he kept coming back to Pensacola State College. “PSC embodies everything that I am, so it’s easy for me to embrace it. When I get up in the morning and I have on my schedule that I get to go to a school on behalf of PSC, I’m excited,” proclaimed Sheppard. A Pensacola State recruiter, Sheppard said he enjoys interacting with local high school students. This school year, he has spoken to more than 500 high school seniors about the opportunities that Pensacola State offers. “I’m able to talk to them about my circumstances, relate to them. I’m also able to paint a picture for them that there is hope. There is opportunity. But it’s also going to take work,” Sheppard said. To simply say that Sheppard is a success story misses the mark. Along with his achievements, there were a lot of failures. Thanks to a program administered through Florida Department of Children and Families, Sheppard was able to attend college. “They supplied the financing to go to college. I started here at Pensacola State College and I had my ups and downs throughout the journey,” he explained. 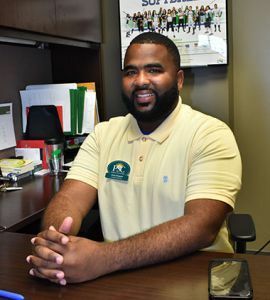 Sheppard attended Pensacola State briefly, then transferred to other colleges hoping to pursue college sports, then he dropped out and got a job in sales, but he had people who cared enough to help him get back on track. “I was so blessed to have Dr. Judy (Floyd) at the Warrington campus and Al Huffman, they were almost like my personal guides in assisting me to graduating college …They encouraged me to come back to college,” Sheppard said. Even then, he still had a few glitches. Sheppard changed his degree path and took statistics instead, which he passed. Sheppard finished his coursework at Pensacola State and then completed his bachelor’s degree in interdisciplinary social science at the University of West Florida. He is not only a first-generation college graduate, he’s the only college graduate in his family. Many of the students Sheppard addresses don’t believe they can go to college. He believes Pensacola State offers options for people at every socio-economic level and is affordable for everyone. “Everybody’s terms of what’s ‘affordable’ are different – depending on your household, what your parents do for a living and your circumstances. I think that when you show them what Pensacola State offers financially, it gives them the opportunity to say, ‘Man, I can do this,’” he said. To illustrate that an education is within their means, Sheppard often asks students to add up the cost of the outfit they are wearing. “I tell them that those Jordans cost $200…and a class costs $313. You can take one course at a time and still get to the point of graduating college,” he pointed out. Sheppard’s professional background includes teaching, coaching football and motivational speaking. He originally applied to work in Pensacola State’s Call Center, but says Kathy Dutremble, the college’s dean of enrollment services, encouraged him to pursue a position in recruiting. Sheppard is glad he took that advice and admits he loves his job. “You become a mentor without knowing you’re a mentor. You never know who you touch, no matter their race, no matter their age,” Sheppard said. Sheppard and his wife, Krystal, have been married for six years. They don’t have any children, but Sheppard’s 10-year-old sister, Spring, recently joined their household. “We’re working hard to help her get caught up – tutors, summer camps, after school programs, meeting with the teacher. I’m her big brother as the father figure, but she treats me like I’m just her big brother,” Sheppard laughed. Sheppard focuses on the hope and opportunity that Pensacola State afforded him and continues to use his message to inspire others. “I just tell people my story and I think if I can make it, anyone can. This is where I am at. If I can do it, you can do it,” he added.